MARIETTA, Ga., December 5, 2018—Over the past five years, Snellville, Georgia, has experienced a 51 percent increase in total traffic accidents and a 68 percent increase in injury accidents. 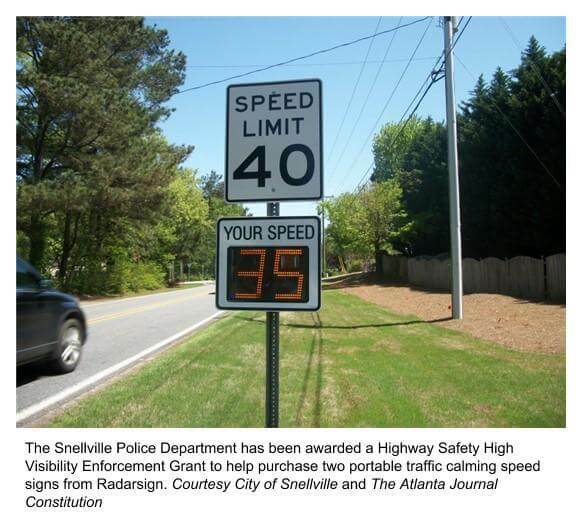 To combat this the Snellville Police Department will be purchasing two portable traffic calming speed signs from Marietta, Georgia-based Radarsign. Radar speeds signs from Radarsign are scientifically proven to reduce speeding using an effective strategy know as Feedback Loops, which provide drivers with information about their speed in real time. This information allows drivers a chance to change their behavior. The purchase was made possible through a Highway Safety High Visibility Enforcement grant by the Governor’s Office of Highway Safety in Atlanta. “The equipment we are purchasing through the grant will advance our mission to reduce injury and fatality crashes in our community,” Chief Roy Whitehead told The Atlanta Journal Constitution. The signs will be equipped with Streetsmart software, which collects traffic data and allows administrators to validate speed-related traffic complaints. It also documents peak speeding times and areas where violations are occuring. With that information, law enforcement officers can decide when and where to place uniform officers to conduct speed enforcement.